My music year began with very good vibes, listening to Dialgo for the first time at Kuli Alma on January 1, 2019. 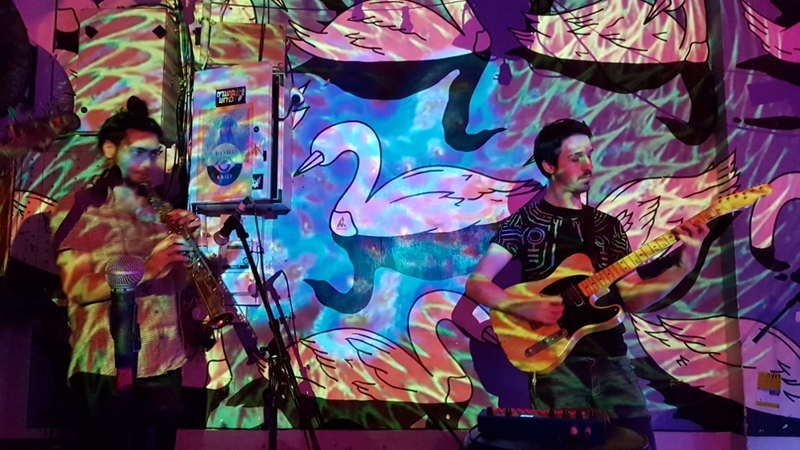 An instrumental group, Dialgo describe their music as “psychedelic/afrobeat/jazz” and after experiencing their sound, it really is a very eclectic mix, and it all works. Dialgo are: Or Alperin – drums, Daniel Harlev – bass, Guy Levinberg – electric guitar & synth, Eitan Rudman – trumpet & sax. A very mellow guitar opening was punctuated by an enthusiastic scream from a tall, shaggy-haired guy behind me in the audience. Trumpet, drums, and touches of bass joined into a melody that sang, the drums really kicked in and the trumpet went wild. Then it all came back home, to a sound with a sense of nostalgia and innocence. One of the things that struck me about Dialgo’s sound is the spontaneous feel of the music and the different directions it takes in each piece. At Kuli on the first day of the year, this sense of the unexpected was heightened by the dancing dudes who, from time to time, shouted out their deepest thoughts and tender feelings: “I can’t remember if I drank my chaser.” Rowdy and boisterous, somehow they too merged with the music. Afrobeat drums led into a piece that sang of wide, open spaces with an intense drum solo opening up to blue skies and easy breezes, with everyone dancing. Taking the night into an electric mind space, was a piece with touches of cymbals, trumpet and synth, like water floating where there is no gravity and all the colors go on forever. And from there it went somewhere even trippier (is that a word? ), going into a groove, then with the sax going into a deep, dark, dense place, punctuated by occasional screams from the drunk dude that were not entirely out of context. The next piece opened with a bass solo, and a quiet trumpet joined in with a tender melody. As it progressed, the guitars, drums and trumpet were all going to different places, yet through it all you could hear the melody, like a beacon of light across a wordless sea. An afrobeat groove led into free jazz wanderings on the sax, and happy chaos. A quiet number closed the set with a meditative electronic feel that developed into an edgier, dense rhythm. Dialgo – different, diverse, and definitely intriguing. Thursday, January 17th Washington SAlooN from 18:00 at Washington Blvd. Florentin, admission free – details on the facebook event. Friday, January 18th Microfest Peace Among Worlds – urban music festival. Secret location to be announced on the facebook event, admission 40 NIS.